Managing several fishing rods at the same time would be a crucial task unless you use the rod holders. I might not need any explanation about the advantages of using several fishing rods as you may already know the advantages of it. Basically, you can use the rod holders from different places as they are differentiated in several designs. Because your style of fishing would be different. So without any arguing at first we should understand the place of where we need to mount the rod holders. Because the different style of the rod holder simplifies the task to use them in different places. So whether you use a kayak, or fishing from the bank, pier, or dock, you will enjoy the advantages of using a few of rods at the same time. Till now these types of rod holders work best for fishing from different places. Let’s read in moments how they are differed from each other and how they work. Spike Rod Holders: people who love to fish from the beach, shore or bank, they might like to use the spike rod holders. Because these holders can grab the rods once you have pushed the spike into the mud, sand, dirt or gravels. The bad side of these holders they can’t strongly grab the rods if you enter the holder over soft or muddy surface. So when you enter the spike into the surface, make sure you have properly entered it and after entering don’t forget to check the strength level. Clamp On Rod Holders: if you don’t want to drill in your vessel, but want to adjust a rod holder without creating any holes, then the clamp on rod holders offer some advantages. Because you don’t need to drill on the deck of boat or canoe, just loose the screw regarding to the size of the edge of your vessel or any compatible position, place the clamp into the target position and start tightening up the screw. You can also use these rod holders on the docks through applying the same method. Flush Mount Rod Holders: one of the greatest solutions as the flush mount rod holders would never let your rod displaced from its position. Even the fish can break down your rod, but the handle of the rod won’t lose its position. You can use the flush mount rod holder on your boat, kayak or canoe, but you have to really work hard to install a flush mount rod holder. Don’t worry, you can follow this tutorial to get a solution. But carefully do this task while you must ensure that you aren’t going to damage your vessel. 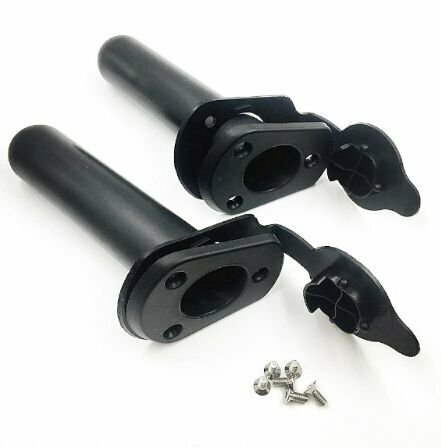 Lock Rod Holders: The lock rod holders would be a great solution and basically these rod holders are great for the kayaks that have uni-track rail system. 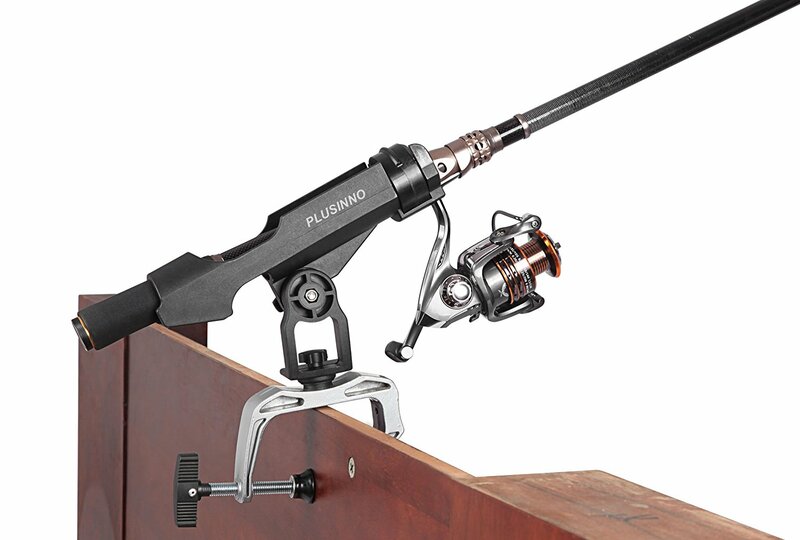 Although you can adjust a rail by DIY method and then you can simply adjust your rod holder by the mounting bracket. In some cases, these holders come with different type mounting brackets that can be adjusted with the deck, but all you need to drill and screw the floor to get the rod holder adjusted. Rack Rod Holders: Rack rod holders basically align in a row where 3,4, 5 or more rod holders are aligned. For the summer fishing time with a boat or yacht in a deep ocean, only one or two rods of fishing wouldn’t lead a desired success in fishing on the ocean and without any doubt casting the lines with several rods for containing heavy lures and big fishes create numerous possibilities for enhancing the success rate. So the rack rod holders come here effortlessly hold multiple rods together. Although, the rack holders don’t offer a better adjustment and desired rod management for kayak. But on bass boats and yacht they eliminate the complications on limited rod management. 1 Should You Consider The Materials Of A Fishing Rod Holder? Should You Consider The Materials Of A Fishing Rod Holder? If you look for a metal based rod holder, then it should resist the rust. Otherwise the saltwater would be able to damage it. That’s why the aluminum would be good while the marine grade stainless steel isn’t bad. Because, theses materials are robust and prevent the rust. 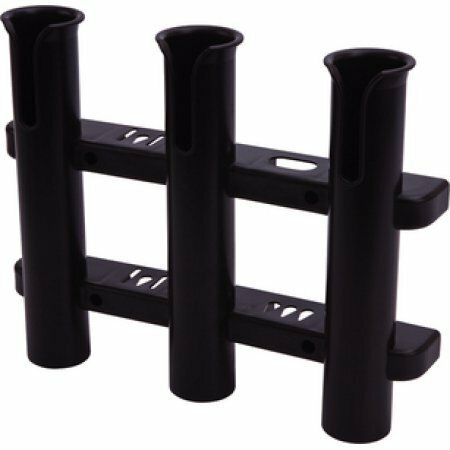 On the other hand, if you choose plastic material based rod holders, I recommend the ABS plastic based holders. Because, these are robust and impact resistant. So it won’t be bent or broke because of the pressure of a hooked gamefish. Saltwater or Freshwater: Rod holders are intelligent here on preventing the saltwater. If you adjust the ABS plastic or fiberglass rod holders, the water isn’t something that would degrade the quality. On the other hand, the aluminum, stainless steel and brass are something that prevents the degradation of saltwater. Basically for kayak the flush mount, clamp on and lock rod holders are efficient on being adjusted while they give a simple rod management on the way you want for kayak fishing. These rod holders are molded from ABS, fiberglass and sometimes stainless steel and there is not even minor chances of getting the quality degradation. As well, on the race of kicking out the corrosion the stainless steel, brass and aluminum are also ahead. Till now the saltwater isn’t able to degrade the thickness of them. So confidently depend on these sturdy materials. If you want to fish comfortably with managing several fishing rods at the same time, then you may keep your faith over these ten best rod holders. 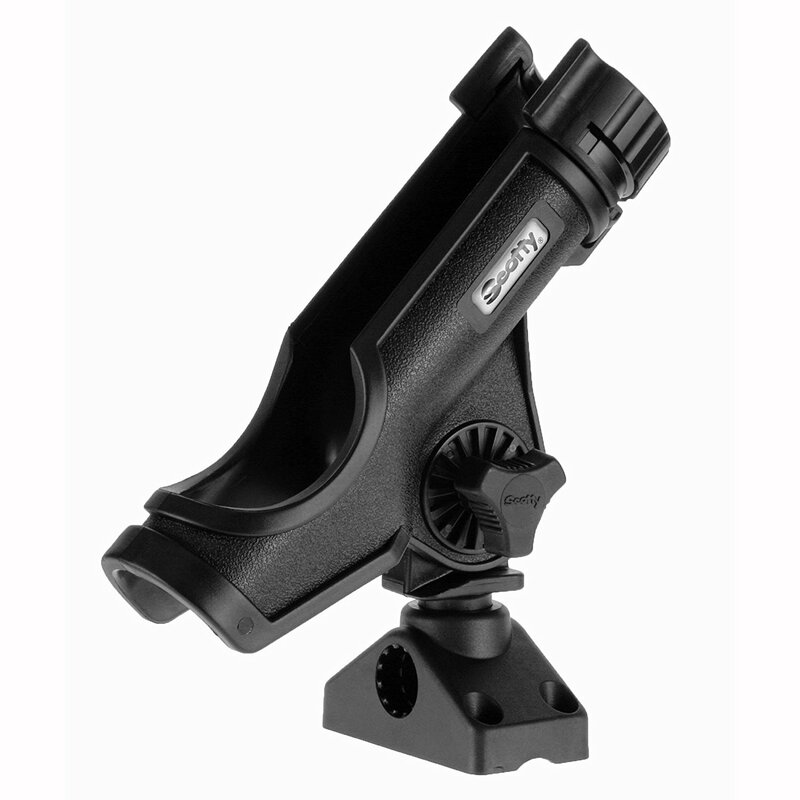 This clamp on rod holder ensures you can easily clamp the holder (by screw) on any suitable position of your boat or kayak. The holder is made of impact resistant ABS plastic that approximately good enough to hold your fishing rod and when it comes to strongly adjust the holder with your vessel, the stainless steel hardware ensures strong clamping. The holder also has 360 degree rotation system that helps to keep the rod on any angle. If you don’t want to create any hole on your double hulled kayak, but want reliable rod management almost like a flush mount holder, then Plusinno boat rod holders can be your dependable choice. They made the clamp from corrosion resistant stainless steel, that won’t fall in broke when the game fishes immediately deliver huge pressure. This powerlock rod holder has a great locking system that can be used to keep the rod on the right angle. Such a locking system easily absorbs the pressure and that’s why the locking power won’t be fading because of the force of hooked fish. Although you need to create some holes on the deck through drilling to ensure a great installation. But you will enjoy a true advantage once you have done the installation. The cradle smartly holds any rod by its ergonomic diameter and if you have the great DIY knowledge, the Scotty mount holders also can be adjusted on rail or track. When it accommodates different rods in the cradle, a front locking system intelligently locks the rod and protect the rod from losing. Basically, this clamp on rod holder is designed to be adjusted on the rail. So your vessel should include the rail and you can properly tighten up the mounting bracket to adjust this holder. You can set the holder on 32 different angles and inside the holder it has a rubber coat to prevent damages. The holder is constructed with marine grade stainless steel that is robust and can survive well in the saltwater environment. You can simply adjust this holder with any horizontal or vertical rails. Once you have accomplished the adjustment on the rail, you can put the baitcaster in it for the purpose of catching game fishes. Because, the robust construction won’t break or bend because of immature pressure. Do you love fish from the shore or bank? This Fish-N-Mate 266 Sand Spike is a good creation for those enthusiasts. Basically, you can completely get it ready in fishing without any hassle of installation. It’s made of anodized aluminum that is robust, lightweight and corrosion resistant while you can easily insert it into the bank, sand and mud surface. You can insert this 50” long rod holder far away from the surface that basically would work like a strong pole to keep the rod strongly in place. The surf fisherman or who fishes following the tide from the shore, they can keep the hands free after casting the line. As well, it can be helpful on fly fishing. Now you got to drill on the deck to make some holes. Because this flush mount rod holder wanted some of your efforts to get adjusted with your vessel. To make the holder robust the manufacturer molded ABS plastic that won’t be cracked or bent because of the line pressure of a hooked fish. The holder comes with a cap that you can use when the holder is not in use. So, there won’t have any insects because of the captured water and when you keep the hole covered, it would be no longer on capturing any water. Theses robust holders literally offer the best holding ability as flush mount holders. So a little bit of DIY knowledge about holder adjustment would give you amazing hands free rod management. You need marine grade accessories and there requires some exceptions to become an avid angler or fisherman. Because an avid fisherman makes their things limitless and having some adventurous fishing trips is their major goal and this is where they need top grade marine accessories. 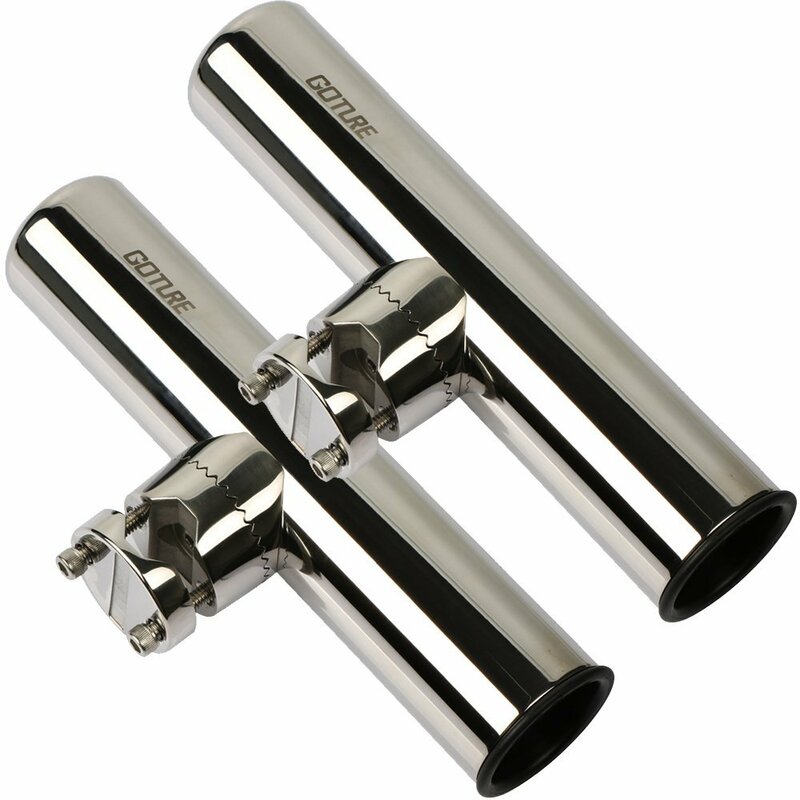 This Goture rod holder is designed for the marine boat, fishing boat or bass boat that is incredibly robust and made of marine grade steel to resist the rust. The best mounting option for it is the side of your boat’s deck. Its 1.8 inch internal diameter simply contains the handle of a rod. Finally, we have selected the one here that we so called rack rod holders to contain several rods in an aligned raw. It mounts three rods at the same time while it additionally offers knife, lure and fishing plier mounting holes. 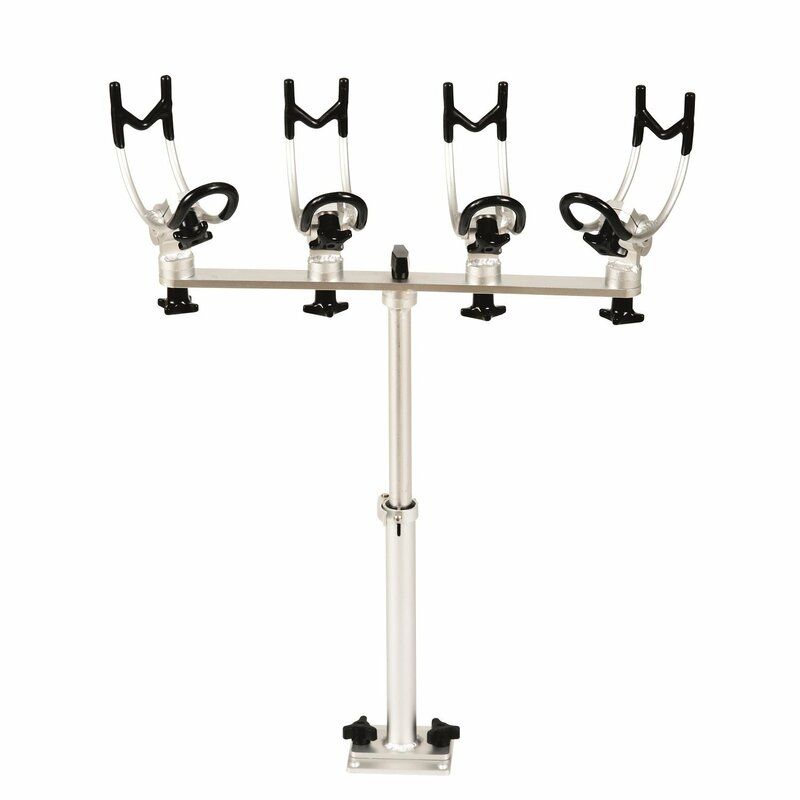 The polypropylene molded body is praiseworthy as it has guaranteed durability while the bolt mounts on two different lines give maximum sturdiness on mounting the whole holder. The polypropylene in its construction is UV stabilized what protects it from being weak and color fading. Just a little bit drilling and screwing required to be mounted on the perfect side of the boat. Like Sea Dog 325039 it is the leader on managing a few of rods, but the way is praiseworthy and remarkably comfortable than the Sea Dog 325039. The cradle not only rotates vertically, but you can also horizontally set the angle and lock the cradle on any vertical and horizontal angle. The shaft has advantageous settings on extending and narrowing the height while the foot indirectly adjusts with the deck by an aluminum plate. The supportive plate stays attached to the deck by screws and the foot of the shaft gets connected to it by easy adjustable and removable screws. Not all we are involved in offshore fishing, some of us just want to take the clean breaths near the ponds or lakes with catching some common species of whitewater. So for simple whitewater fishing you don’t need the monster power in all of the accessories. With a small pound line based reel and 5’ rod there can be a mini fishing adventure. 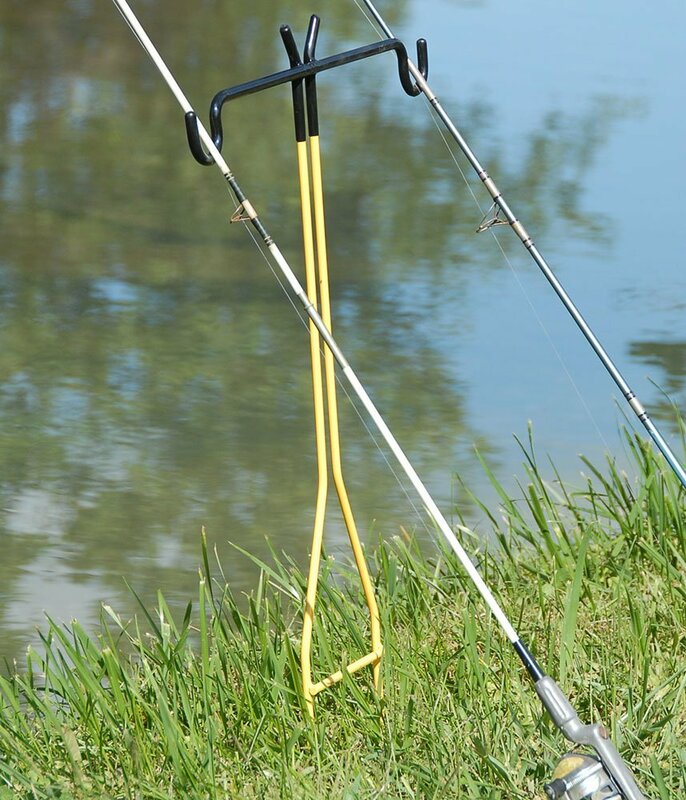 So this Rite-Hite rod holder is a simple rod holder that can cradle the rods beside the pond, lakes, river or stream. Just insert the spike into the ground and get the holder ready to cradle the rod in less than a minute. This is simple, compact and yet another one for those guys who fish with relaxing beside the pond or lakes. Just enter the spike into the bank, adjust the cradle and let the rod stay with relaxation. When the fish bites, get the rod in your hand and give a big shake. It’s is foldable and combinedly made with aluminum and ABS plastic on separate position. 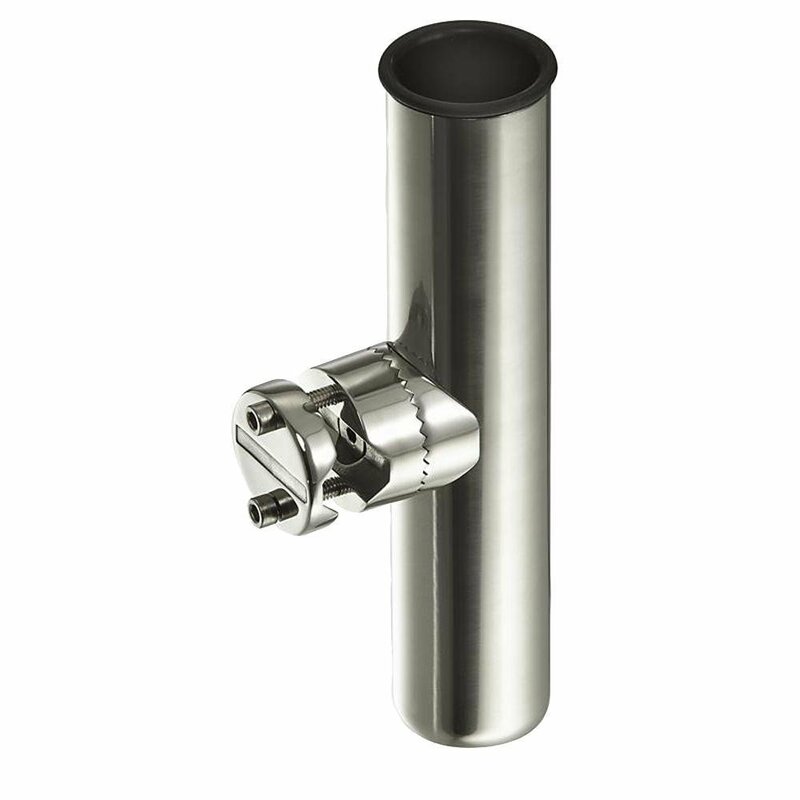 The tubular holder with reliable diameter holds the handle simply while all type of rods can be accommodated in the holder. From our research and over the feedbacks of people it is confirmed that these rod holders have the quality and some great sides. But before picking any model, make sure you are comfortable with that model or you have got that model what you exactly want. Because sometimes the model varies with your style of fishing. 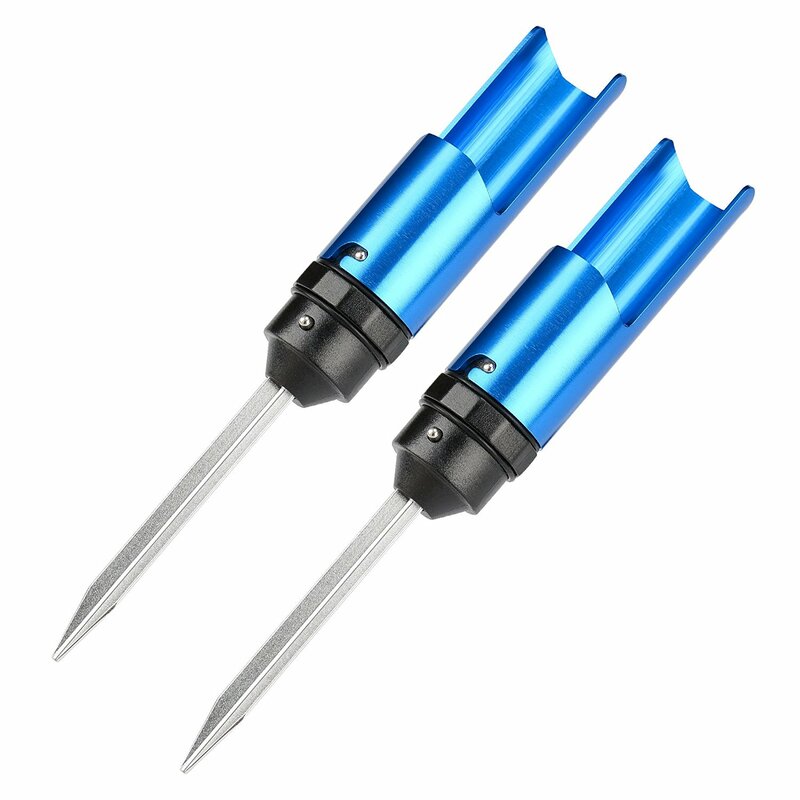 As an example, if you choose the spike rod holder, you can only use it fish from the shore or bank while the rest ones have different types of adjustments regarding your choice and needs.